Regardless of a person's age, loneliness is often as debilitating a health condition as having a chronic illness or disease. Sadness and isolation can be combatted by the availability of accessible, affordable and fun social activities. 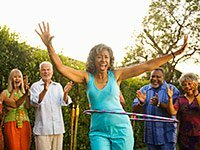 The following list of resources — from AARP and elsewhere — relate to Domain 4 of the "8 Domains of Livability." The content is categorized into two groups by level of difficulty, with the first group generally being the easiest reads for people new to this work.